North Carolina’s delegation in Washington has introduced bipartisan legislation that would pave the way for U.S. 70 to become an interstate highway in Johnston County. Known as The Military Corridor Transportation Improvement Act of 2015, the bill would make U.S. 70 a “high priority corridor” from its intersection with Interstate 40 in Garner to the state port in Morehead City. By amending the Intermodal Surface Transportation Efficiency Act of 1991, the bill would make U.S. 70 part of the Interstate Highway System if it were improved to the required standards. 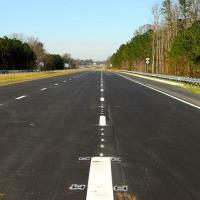 The bill would do the same for U.S. 117/Interstate 795 from U.S. 70 in Goldsboro to I-40 in Faison. It is unknown what number the upgraded U.S. 70 would take, as Interstate 70 already runs 2,150 miles from Utah to Maryland. While the bill’s name focuses on its military significance, an upgraded connection from Raleigh to the beach would also have obvious benefits for tourism and the movement of freight. U.S. 70 runs through Johnston, and its improvement would make the area much more attractive to businesses and industries, said Chris Johnson, head of the county’s economic-development office. A direct connection to the state capital and the Morehead City port could place Johnston “in the epicenter of potential growth,” Johnson said. That would give a big boost to towns along the route, including Smithfield, Selma, Princeton, Pine Level and Wilson Mills, he said. In prepared statements on the bill, North Carolina’s lawmakers in Washington touted its potential benefits to both defense and the economy. As the bill’s co-sponsor, Sen. Richard Burr said it would allow North Carolina to refurbish and expand its highway system. “Improvements to this infrastructure is critically important to local communities and will make this high transit corridor safer, faster and more modern, ensuring that North Carolina’s economy continues to be one of the most vibrant in the country,” he said. Reaching across the aisle to join North Carolina’s two Republican senators, Democratic Rep. G.K. Butterfield sponsored companion legislation in the House of Representatives. He called the bill vital and said it would stimulate job growth throughout the eastern part of the state.